2 RS422 Inputs x 1 RS422 Output. Ideal for Automation System Backup, in case of failure. Quickly and Easily switch from On-Air automation system to backup control system at the press of a button. Electronically buffered inputs and output. No mechanical multi-pole switches to wear and go intermittent. Front panel and remote A/B select. Front panel lockout for remote only operation. 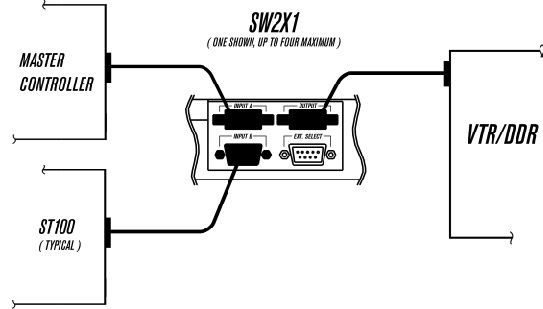 The SW2X1, Electronic A/B Switch has 2 buffered inputs and one buffered output for easy interfacing. There are no mechanical multi-pole switches to wear out and fail. Front panel control, and remote control, provide flexible operation to fit your specific application. Switch control for all VTRs, individual VTRs or groups of VTRs. Space efficient. Four A/B Switches in 1 RU rackmount housing. In the event of SW2X1 power failure, the on-board bypass relay switches the “A” input to OUTPUT connector.